Historically, Calcutta was the epicentre of activity in the early stages of the national movement of independence. Exactly a hundred years after the fall of Bengal in the Battle of Palashi, Calcutta saw the beginning of what is often called the First Independence Movement of India. It should be noted here that it is also just as often not referred to as as a War Of Independence, and as one historian put it, "The so called First National War of Independence was neither First, nor National, nor a War of Independence". In the suburbs of Calcutta, at the Barrackpore military barracks, sepoy Mangal Pandey sparked off a huge revolt that shook the foundations of the British Empire. This movement is sometimes also called the Indian Mutiny, although recent evidence goes against using this name and suggests the Revolt of 1857 as better and less controversial choice. The Indian National Congress was born here, as also were many contemporary societies like the Hindu Mela and revolutionary societies like the Jugantar and the Anushilan groups. Among early nationalist leaders, the most prominent were Sri Aurobindo, Indiradevi Chaudhurani, Bipin Chandra Pal. The early nationalists were inspired by Swami Vivekananda, the foremost disciple of the Hindu mystic Sri Ramakrishna and helped by Sister Nivedita, disciple of the former. The first native president of the Indian National Congress Sir Womesh Chunder Bonnerjee and the first Congress president to advocate self rule by Indians, Sir Surendra Nath Banerjea (referred to by the British as "Surrender Not") were early eminent Calcuttans, who provoked and influenced nationalist thinking in the late 19th and early 20th centuries. The rousing cry that awakened India's soul was penned by Bankim Chandra Chattopadhyay, now the national song of the nation, an ode to the land of Bharat (India) as the Divine Mother, Vande Mataram. The Elgin Road residence of Subhash Chandra Bose in Calcutta was the place from where he escaped the British to reach Germany during the Second World War. He was the co-founder of the Indian National Army and the Head of State of the Arzi Hukumate Azad Hind, formed to counter and combat the British Raj in India and was renamed Netaji by poet laureate Rabindranath Tagore. 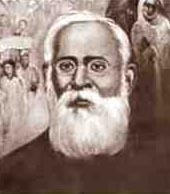 He is regarded by many as perhaps the most prominent and influential freedom fighter in Indian history and is venerated in many Bengali households even today.